PBS KIDS’ series DINOSAUR TRAIN will premiere an all-new one-hour special, “What’s at the Center of the Earth?,” on Monday, February 20. Created by Craig Bartlett (READY JET GO!) and produced by The Jim Henson Company, DINOSAUR TRAIN encourages kids ages 3-6 to apply scientific thinking as they discover new types of dinosaur species, and to embrace the living sciences of paleontology and natural science. In “What’s at the Center of the Earth?,” the Conductor has a special surprise for the Pteranodon Family: the Dinosaur Drill Train. This amazing machine gives its passengers a front row seat as they dig deep underground on a once-in-a-lifetime adventure below the Earth’s surface. There, they discover a whole new world – from fossils and troglobites to rivers of lava. Along the way, the family gains a new perspective on our planet and what it’s made of. Following its premiere, “What’s at the Center of the Earth?” will repeat throughout February on PBS stations and the PBS KIDS 24/7 channel and live stream. It will also be available for free on both pbskids.org and the PBS KIDS Video App, which is accessible on a variety of mobile devices and platforms such as Roku, Apple TV, Amazon Fire TV, Android TV, Xbox One and Chromecast. In addition, “What’s at the Center at the Earth?” and four additional DINOSAUR TRAIN stories will be available on DVD from PBS Distribution on Tuesday, February 21. New digital content from DINOSAUR TRAIN will include “Fossil Finder,” a game that encourages kids to travel underground in the Drill Train to search for fossils. The game will be available the week of February 13th on pbskids.org and on the free PBS KIDS Games app. DINOSAUR TRAIN airs weekdays on PBS KIDS (check local listings) and daily on the PBS KIDS 24/7 channel and live stream. “What’s at the Center of the Earth?” – Layers! The Conductor takes the Pteranodon family on a very special journey on a new invention – the Drill Train – in search of the perfect spot for a new underground Dinosaur Train station! Don is THRILLED to be venturing into the BIGGEST HOLE THE EARTH HAS EVER KNOWN! Shiny is nervous to be underground, until they meet a new friend (a Mesozoic mole named Natasha Necrolestes), who teaches them all about the different layers of the Earth. “What’s at the Center of the Earth?” – Fossils! As the Pteranodon family continues their journey underground, Don accidentally breaks Buddy’s trilobite fossil (the oldest fossil in his collection)! When the search for another trilobite fossil turns up empty, their new friend Natasha Necrolestes takes them to Fossil Alley, where the kids learn that the older the fossil, the deeper underground it is. “What’s at the Center of the Earth?” – Troglobites! 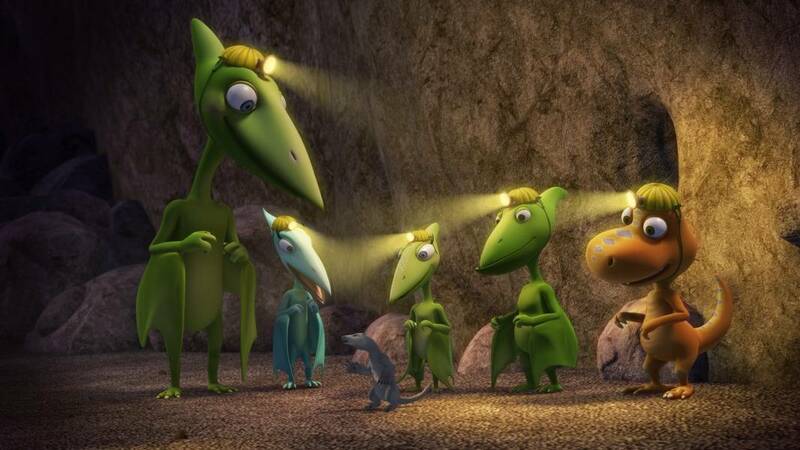 The Drill Train burrows into an underground limestone cave, where the Pteranodon family meets some strange eyeless creatures called “troglobites.” In a contest to see who would make the best troglobite, Buddy, Tiny, Shiny and Don participate in a treasure hunt – with their eyes closed! The kids have to rely on their other senses (with some guidance from the actual troglobites) to navigate the cave and find the prize. “What’s at the Center of the Earth?” – Minerals! While digging even further underground, the drill bit on the Drill Train breaks. The Pterandons find themselves in the Cave of Giant Crystals, where they learn all about rocks and crystals (what they are, how they’re different, how they form). In order to get back home, the Pteranodon family has to fix the drill bit by finding a mineral harder than the mineral that broke the bit in the first place.